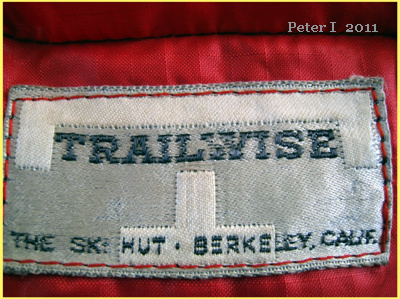 Probably the very earliest Trailwise label. Begun even earlier than GERRY in Colorado, George Rudolf's "The Ski Hut" was probably the single strongest influence and source for modern, lightweight backpacking and climbing gear during the 1950s and 1960s for persons on the West Coast. The Ski Hut was formed in 1935 in Berkeley, CA by Mr. Rudolf and a partner Phillip Von Lublein. World War II closed up the shop until 1946, the same year that GERRY moved itself to its permanent home in Ward, Colorado. During Ski Hut's early years, it was not so much a gear-making innovator company as it was an importer and supplier of the things that climbers, skiers and backpackers needed. But this changed sometime in the early 1950s (probably 1951), when Mr. Rudolph created "TRAILWISE," and thus began the period of Rudolf's company creating its own designs and products. In the late 1950s, Mr. Rudolf formed "Donner Mountain Company" (DMC), which was mainly an importer, and which was responsible for the late 1960s craze about Pivetta boots from Italy (I owned two pairs and was wild about them!). Over the course of its history, the original The Ski Hut store became one facet of a larger holding which included the Trailwise manufacturing, DMC, and a thriving Mail Order component.